Back in December, I wrote that Frank Bidart was turning into poetry’s equivalent of Susan Lucci, the soap opera star who lost l8 daytime Emmy awards before winning on her 19th nomination. After decades of work, Bidart is one of America’s most respected poets, but he has never won a National Book Award, a Pulitzer Prize or a National Book Critics Circle Award. I noted in a review of his latest book that Bidart has written seven poetry collections, and if his publisher nominated each for all three prizes, he passed Lucci in November when he got his 19th snub: He lost the National Book Award for poetry to fellow finalist Mark Doty. He had a chance to win on nominations No. 20 and No. 21 for the most recent NBCC and Pulitzer prizes but didn’t make the shortlist for the critics’ award. 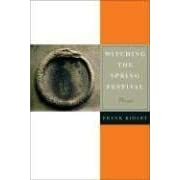 And he was a Pulitzer finalist for Watching the Spring Festival (Farrar, Straus & Giroux, 72 pp., $13, paperback). Did Lucci send a sympathy card? One of the country’s most respected poets is always a bridesmaid for the top prizes. At least the National Book Awards people don’t make you wear bad dresses to the ceremony. Watching the Spring Festival: Poems. By Frank Bidart. Farrar, Straus & Giroux, 58 pp., $25. Frank Bidart is turning into poetry’s Susan Lucci, the soap opera star who lost l8 daytime Emmy awards before winning on her 19th nomination. He has spent decades in the trenches and is one of America’s most respected poets, but he has never won one of the Big Three honors in the field: a National Book Award, a Pulitzer Prize or a National Book Critics Circle Award. Bidart has written seven poetry collections, and if his publisher nominated each book for all three prizes, he passed Lucci in November when he got his 19th snub: He lost the 2008 National Book Award for poetry to fellow finalist Mark Doty. He still has a chance to win on nominations No. 20 and No. 21 when the NBCC and Pulitzer prizes are awarded in 2009. What explains his perennial bridesmaid’s status? Bad luck — always a possibility in the iffy realm of book awards — may play a role, given that Bidart has won many other honors. But I suspect that more than chance explains some of his rejections. Bidart often focuses on unpleasant or even grisly subjects. The first of his seven collections had a poem written in the voice a psychopathic child-murderer and necrophiliac. Even as an editor with an intimate knowledge of the uses of square brackets, I wonder how to read that line. How would you read the brackets aloud? Doesn’t it matter if you can’t? First published in The New Yorker, these are chilling lines. But they read like a speech to an American Legion convention. How has the nation betrayed the Gettysburg dead? What freedoms has it stifled? Is the speaker describing a general or specific warp in the national unity? The poem doesn’t say and instead has a whiff of the harangue about it. The subtext seems to be: You know you’re guilty, and I don’t need to tell you why. * Please note that this template can’t reproduce correctly the number of spaces between Bidart’s square brackets. There should be approximately seven spaces. Best line: The sestina “If See No End In Is” departs from the standard form in interesting ways. Bidart omits the three-line envoi at the end. And instead of repeating the end word “no” in the prescribed numerical order in each stanza, he sometimes substitutes the homonym “know” or “know-“ (the first syllable of “knowledge”). Read the full sestina at www.poetryfoundation.org/archive/poem.html?id=180058. Worst line: The first line of the poem “Under Julian, c362 A.D.,” quoted above. About the author: Bidart www.poets.org/poet.php/prmPID/162 teaches at Wellesley College. His won Yale University’s 2007 Bollingen Prize for American poetry. The National Book Foundation site has more on Watching the Spring Festival www.nationalbook.org/nba2008_p_bidart.html. Bidart also wrote Desire, a finalist for the National Book Critics Circle Award for poetry when I was a judge. That year, he lost to Charles Wright. Furthermore: Bidart co-edited Robert Lowell’s Collected Poems and may have intended “To the Republic” as a dialogue with Lowell’s “For the Union Dead,” which the critic William Logan has called “perhaps the most significant political poem of the last half-century.” If you’ve read both poems, I’d welcome comments on how if at all they converse. Janice Harayda has been the book columnist for Glamour, the book editor of the Plain Dealer in Cleveland and a vice-president of the National Book Critics Circle www.bookcritics.org. © 2008 Janice Harayda. All rights reserved.